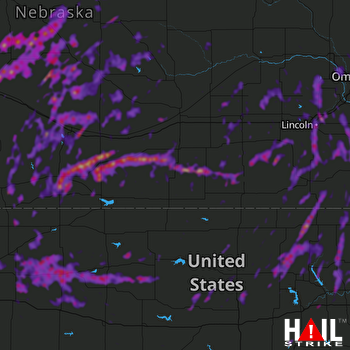 Doppler radar detected Golf Ball size hail near Lincoln, NE, Kearney, NE and Papillion, NE on July 1, 2018. This hail storm was traveling ENE at 14 mph and the entire storm produced hail for roughly 8 hour(s). There were 14 spotter report(s) with reported max hail size of 2.75″ and an average hail size of 1.75″. We estimate that 116,048 buildings were in the affected area and the probability of hail DHI detected was significant. Based on this information, you can expect to find widespread roof damage, broken glass and automobile bodywork damage in well populated areas. 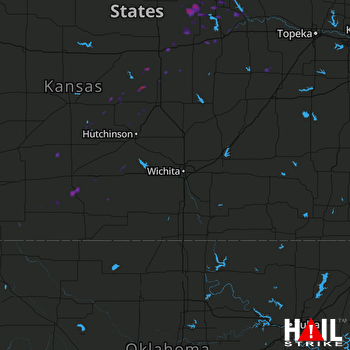 Doppler radar detected Golf Ball size hail near Concordia, KS, Clay Center, KS and Holton, KS on May 2, 2018. This hail storm was traveling E at 37 mph and the entire storm produced hail for roughly 5 hour(s). There were 30 spotter report(s) with reported max hail size of 4″ and an average hail size of 1.81″. We estimate that 45,156 buildings were in the affected area and the probability of hail DHI detected was significant. Based on this information, you can expect widespread, severe damage to tiled roofs, automobiles, and aircraft over highly populated areas. Risk of personal injury is also high, and is often accompanied by other severe weather events (wind, tornadoes). Doppler radar detected Quarter size hail near Olsburg, KS, Randolph, KS on October 14, 2017. This hail storm was traveling ENE at 68 mph and the entire storm produced hail for roughly 2 hour(s). Radar reported a max hail size of 1″ and an average hail size of 1″. We estimate that 14,561 buildings were in the affected area and the probability of hail DHI detected was significant. Based on this information, you can expect potential damage to fruit, crops and vegetation, but not much else (Impact Rating 1). 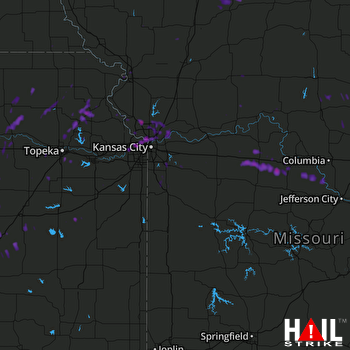 Doppler radar detected Quarter size hail near Kansas City, MO, Shawnee, KS and Liberty, MO on August 21, 2017. This hail storm was traveling ESE at 27 mph and the entire storm produced hail for roughly 2 hour(s). There were 1 spotter report(s) with reported max hail size of 1″ and an average hail size of 1″. We estimate that 50,615 buildings were in the affected area and the probability of hail DHI detected was significant. Based on this information, you can expect to see minor damage to vehicles, tile roofs and crops in isolated areas (Impact Rating 2). 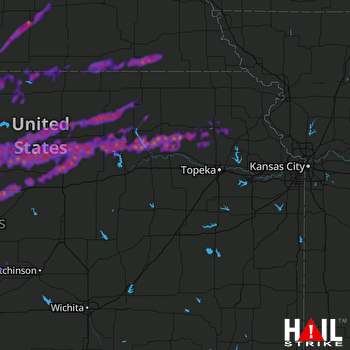 Doppler radar detected Quarter size hail near Holton, KS, Mayetta, KS and Westmoreland, KS on July 23, 2017. This hail storm was traveling NE at 3 mph and the entire storm produced hail for roughly 3 hour(s). There were 1 spotter report(s) with reported max hail size of 1″ and an average hail size of 1″. We estimate that 1,358 buildings were in the affected area and the probability of hail DHI detected was significant. Based on this information, you can expect potential damage to fruit, crops and vegetation, but not much else (Impact Rating 1).